The Konavle region is on the southern tip of Croatia.There are 20 villages in Konavle, the largest of which are Cilipi and Gruda which is the region’s administrative capital. All except Cilipi and Gruda are on the slopes of hills or mountains. As an agriculturally productive region, it was a most important asset to the Republic of Dubrovnika. The villages still contain reminders of Konavle’s fascinating history. In the village of Pridvorje is a Ducal palace that recalls the days when wealthy Dubrovnik residents built villas in the region. In the hamlet of Mocici is an ancient temple complex as well as traces of an even earlier Illyrian shrine. The small medieval town of Cavtat is both the tourist and cultural centre of Konavle. Among the many significant cultural sites are the Mausoleum of the Račić family, the birthplace of Vlaho Bukovac, the Ducal Palace and the Sokol Fortress. Cavtat is the most southern town in Croatia, and the most practical way to reach the town is by air. Cilipi (Dubrovnik) airport is just three miles away.The City of Cavtat has a population of some 1,500 inhabitants, and is itself part of the Dubrovnik Riviera (twenty kilometers south of Dubrovnik, and 3 km of the main coastal highway). In Cavtat there are plenty stunning and unique bays and beaches. The special charm of this old city are the buildings that have remained from the time of the old Dubrovnik Republic. 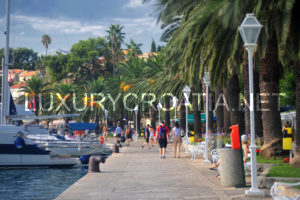 This city was also built according to the regulation plans prescribed by the Republic, and the result was the present-day look of the old part of Cavtat. A larger part of the monuments of history and culture belong to the fine but modest Renaissance architecture with some traces of the Gothic style: the Rector’s palace, fortifications, city walls round the city, squares, St. Nicholas’ church, the church dedicated to Our Lady of Cavtat and the Franciscan monastery. This ancient city with its surroundings keeps many traces of the old, several thousand-years’ long history. It had been built several times and restored from ruins and total destruction. It used to be the flourishing famous city Epidaurum, well known in the ancient times and after the total destruction in the 7th century only the deserted ruins remained. When the Republic bought Cavtat with Konavle in the 15th century it was built up again on the ruins of the old city. Augustum. Today the small hill is the place of the masterpiece of the great Croatian sculptor Ivan Mestrovic, and from there his St. Rock’s chapel, the Mausoleum of the family Racic, dominates the view. Cavtat is still a treasury of art, culture and historic wealth, kept in the Rector’s palace, the museum and the churches, in the Picture Gallery and the many family collections.